Submerged arc is a mechanized process, where one or more wires are fed through a conduit and a contact nozzle up to the welding arc. Solid wires are mainly used, but certain tubular types are also developed for this process. The arc and the molten pool are protected by a mineral flux supplied in front of the wire, this melts and creates a slag which also contributes to a particularly smooth and even weld surface. A lot of different types of flux is available, in addition to protection they may also influence weld chemistry and mechanical properties. The flux comes by hose from a separate hopper, and surplus flux usually sucked up and returned to the hopper. The arc burns underneath the flux cover, whereby UV-radiation is avoided and amont of smoke is negligible compared to ”open” processes. 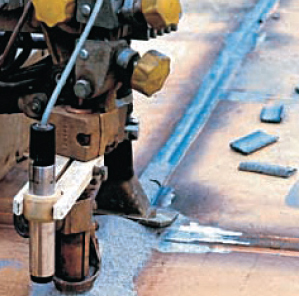 Submerged arc welding is suitable for most unalloyed and alloyed types of steel, but only works in the downhand horizontal position. The process stands out by its good welding economy, which is caused by a high deposition rate, and in general few welding defects. Submerged arc is also extensively used for cladding, where wear resistant or corrosion resistant metals are deposited onto ordinary steel. Submerged arc welding is commonly used on welding tractors and column & booms, but also very suitable for higher degrees of mechanization, in combination with manipulators for sylindrical and other work pieces. Welmax construct and deliver complete production plants.